But it has really given me a much needed peace of mind ... I dunno why I was so worried. I guess since I'm now 34, I've heard many stories of friends who've miscarried their first pregnancies ... and others who have struggled to even get pregnant for the first or second time. I guess it's about wanting something so bad and just being nervous. But all is looking good. I know it's still not a 100% sure thing ... they do say wait till 12 weeks and all, but seeing it, not an empty sac (biggest worry! ), has made a world of difference. It's real, it's there. It has a teeny heart beating a million times a second (okay, so not quite that much, but faster than ours nonetheless). We couldn't hear the heart yet (cause it was just an ultrasound tech, not a doctor, they said they won't do them till 12 weeks), but we sure could see the flashing little blip in the middle of the peanut / jellybean shape. In case you're wondering looking at that very un-baby-like looking photo, the baby is the peanut shape at the bottom. The circle thing floating above it is apparently the yolk sac. 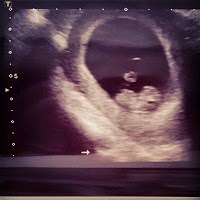 So today was probably the most exciting day since we first found out (shew, it's almost a month since then already!). Yay! I always loved being pregnant, in spite of the niggles. It was, for me, a time of nurturing a deep secret (even though everyone knew it :-P ) and feeling all the different changes happening in my body helped me to bond with each of my babies in a unique and private way that no-one else could intrude on.